The Verdict: iLife or Roomba? We’ve all seen funny videos where pets square off against a robot vacuum. But while you’re laughing, have you thought about getting an automatic vacuum for yourself? These little devices keep your home clean; all you have to do is set a schedule for it. There are many options to choose from though. So even though you’ve likely heard of the Roomba, there might be another brand out there you’ll like better such as ILife. ILife has become a quick competitor to the Roomba, so how does the ILife vacuum brand compare to the Roomba then? Both are trusted brands with features their buyers love, with their own advantages and disadvantages. If you’re having trouble choosing one, check out our reviews before you make your purchase. ​You’re a busy person who may not have time to read this entire article. You can read the rest if you want to know everything of course, but you’re here to find out whether you’d prefer the Roomba or iLife brand of robot vacuums. When it comes down to it, the Roomba and the iLife vacuums are on two different playing fields. Each vacuum has its pros and its cons, but ultimately the one that is best for you is up to what you care about when purchasing a robot vacuum. The Roomba includes many high-end, durable options for you to choose from. They’re higher tech and built for the modern world, but you will have to pay more for a Roomba. If you need something that reliably works without too much effort on your part, this may be your better choice. 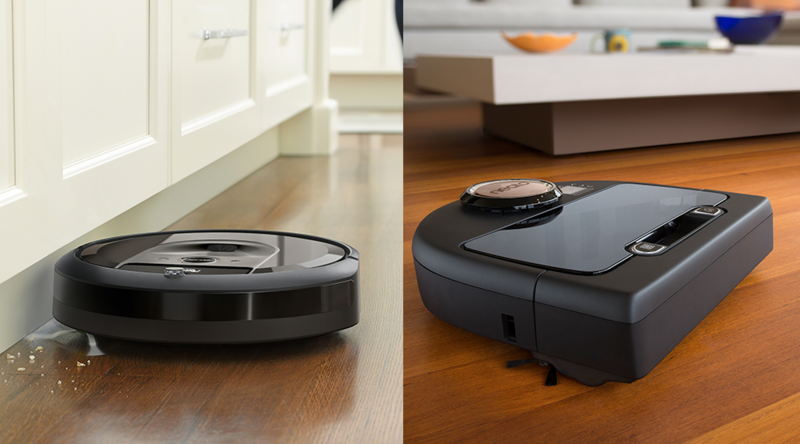 Recent Roomba models like the famous 900 series offer top-tier navigation, suction power, and overall quality. They are best for larger home, or if you have a budget to invest for all the bells and whistles that make for a great robot vacuum. The ILife is light and easy to use though, at a lower price point and with features like a mopping feature that cleans hardwood extremely well. If you have a home with lots of tile or wood, you’ll want something like the ILife to help you. iLife is best suited if you need versatility more than you need power. Roomba do not have the ability to switch between wet and dry cleaning. Their robot vacuums only offer one or the other. If you value overall usability for wide range of cleaning tasks, rather than a vacuum that does one thing, but does it well, the iLife may be a better fit for you. Deciding on a robot vacuum can be confusing, so we are going to break down a few of the key features of the most popular Roomba and iLife vacuums. When comparing the iLife vs Roomba you need to consider that each brand has budget-friendly machines and more expensive options. Make sure you settle on a general budget, then decide which brand is best for your needs after you know what you're willing to invest into a robot vacuum. When you purchase a robot vacuum, you want something that’s small enough to get underneath most pieces of furniture, but that isn’t so small that it does nothing. Most are more or less the same, with a roundish shape, brushes, and buttons or a screen for the controls. When it comes to robot vacuum design, there isn't a whole lot that changes from brand to brand, but when comparing the iLife vs. Roomba, there are a few key things to consider. All of Roomba’s cleaners are 3.6 inches tall, which helps them to get underneath furniture without you having to redirect it or remove it from a tight space. They sport a circular form with a diameter of fewer than 14 inches. They are a little heavier now though by a few pounds. Most Roomba models can be controlled by an app, with the exception of the discontinued/older models, as well as some entry level ones such as the Roomba 650. With these, you have controls located on the top of the Roomba which allow you to set a schedule, start a cleaning, pause a cleaning and show you key statistics such as battery life. For the most part, ILife is smaller, with most of their models below 3 inches. These types are also narrower, with the longest diameter at 13.4 inches. Both the iLife and Roomba are circular though, but if you want a little more color in your life, the ILife might be your best option. It’s lighter than the Roomba too by a few pounds. The iLife robot vacuum cleaners have an LED display which can tell you stats about your robot, help you navigate the menu, and start/stop cleanings and provide troubleshooting error messages. You might be wondering: which vacuum performs better? You want to choose an option that works, regardless of what you spend or what it looks like. Even the most high-tech vacuum isn’t worth it if it doesn’t actually do its job. We tested the Roomba and the ILife to figure out which one works better on different sorts of surfaces and how they navigate. Not only that, but we checked to make sure they could clean multiple messes, like rice, kitty litter, cereal, sugar, and flour. Roomba - The Roomba uses AeroVac vacuuming technology that pulls hair or of floor or carpets. The latest types use suction that is five times more powerful, picking up hair, debris, and dust from the floor. The newer options also clean dust from the floor and wall using side brushes. ILife- ILife worked well on the carpet, but didn’t achieve as great of a clean as the Roomba when it came to carpets. It does work on the walls like the Roomba though, with powerful central brushes to help it clean. Roomba- Since the Roomba has such powerful suction, it works well on wood or tile too. It moves easily over harder flooring types and will adjust the wall it cleans if it goes from carpet to wood by itself. ILife- Thanks to the powerful central brushes, the ILife did a nice job on tile and wood. It was able to pick up a good amount of our test materials quickly. The ease-of-use is important when you purchase one of these vacuums since the whole point is to make your life simpler. Depending on the structure of your house and your own personal preferences, you may like something with more sophisticated navigation. The Roomba has navigation technology called iAdapt, which uses sensors to guide your Roomba around your furniture. This is what allows it to clean more efficiently as these sensors prevent it from falling down stairs or crashing into furniture. iAdapt also allows the Roomba to switch cleaning modes from one flooring type to another automatically. ILife navigation varies depending on what model you choose, but generally, they’re less advanced than the Roomba. They work based on pre-set modes without mapping or switching cleaning modes while they’re working. They’ll clean in a specific map depending on what you set, or depending on where you direct it with the remote. Price is an important part of anything you buy. You don’t want to buy a vacuum that’s too expensive and find that it doesn’t work, or buy a cheaper version that just doesn’t get the job done. What you buy really depends on whether the price is worth it. The Roomba is definitely more expensive than the ILife, with the cheapest model at $300, and many models clocking in at over $500. If you can afford something expensive though and want something with better navigation, then you may be okay with the higher price point. In the end, ILife is more affordably priced than the Roomba. Buyers especially like that it’s less than the $500 that you usually buy Roombas for, usually in around the $100 range. If a price is an issue, this may be the better option. Even though the Roomba has a solid reputation in the industry, no product is perfect. The following are a few pros and cons to consider when pitting the iLife vs. Roomba. Unlike the ILife, the Roomba is programmed to recharge itself when its battery runs out. You can also manually instruct it to charge just by pushing the “Home” button on the top. Most ILife vacuums do locate their charging docks, but they do need to be physically plugged in to charge. For tough areas, you can set up spot cleaning for any area that’s 3 feet in diameter. This means that if you have a tough mess, the Roomba can get it. Certain Roomba models will let you remotely control the vacuum just by pushing a few buttons. The most recent models let you complete this process right from your smartphone, so you can keep your house clean from anywhere in the world. Not all Roombas include this feature though. Later Roomba models use HEPA filters, which will keep smaller dust particles inside the dustbin instead of in the air. This is especially helpful for people with allergies. The Roombas generally last for less time, even if they do automatically charge themselves. Even the best models last on a charge for half an hour less than the ILife when you set them to clean. The Roomba does take longer to get the job done, with a shorter battery life on top of that. This isn’t necessarily a big deal, but it might bother you if you’re unable to get everything in one charge. In the end, the Roomba is more expensive. The price can be a lot for people to handle when they pick one up, especially if you want one of the newer models with the best features. The ILife uses batteries that last for long. All of their models use lithium-ion batteries that will work for about 150 minutes, with the shortest run time at 70 minutes. By comparison, the Roombas will only last for around 60 minutes, or 120 if you have a higher-end model. In the latest ILife models, you have the option for spot cleaning. Just like the Roomba, it will tackle tough messes in one specific spot. Some ILife models allow you to set it to mop on hardwood flooring. Just attach the cleaning cloth after getting rid of the dustbin and inserting the water tank. No Roomba has a wet mopping feature. If you aren’t home, your ILife won’t charge. By contrast, the Roomba will charge itself and keep going, so with the smartphone option to turn it on and off, you can use the Roomba from anywhere. The ILife requires you to be there to plug it in though. The Roomba will let you know when you have to empty the bin, but the ILife will not. Instead, the ILife recommends replacing the bin after every clean, which is a small thing, but which may make a difference in your hectic schedule. To be clear, the newer ILife models do have HEPA filters to clear the air for you. The only problem is if you have an older model, it may have a less-advanced filter that still works, but perhaps not as well. The Roomba is the winner from our tests. It cleans up better with superior suction, works with your phone, and charges by itself. It is more expensive, but it allows you to leave it to work on its own instead of always having to adjust it yourself. The ILife does have some great features though like the wet mopping feature, which may work better for you if you have more hardwood flooring. Neither of these doing it for you? Learn more about the best vacuum cleaners of 2018 to see some other great options.